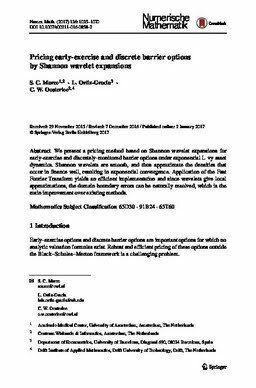 We present a pricing method based on Shannon wavelet expansions for early-exercise and discretely-monitored barrier options under exponential Lévy asset dynamics. Shannon wavelets are smooth, and thus approximate the densities that occur in finance well, resulting in exponential convergence. Application of the Fast Fourier Transform yields an efficient implementation and since wavelets give local approximations, the domain boundary errors can be naturally resolved, which is the main improvement over existing methods.